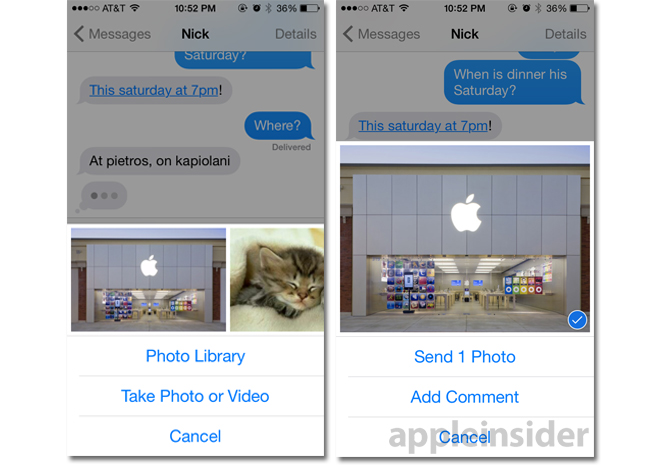 One of the more robust additions to Apple's iOS 8 is the Messages app, which gets a bevy of new functions including inline audio and video messaging, group chats and advanced image sharing. 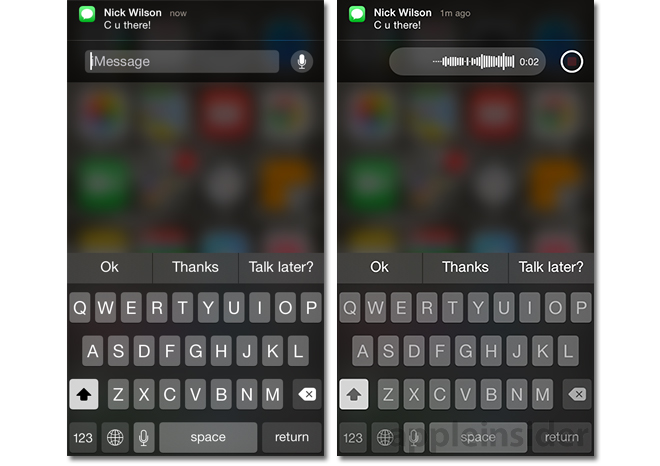 Perhaps the most notable of Messages' new features is in-app audio and video recording. 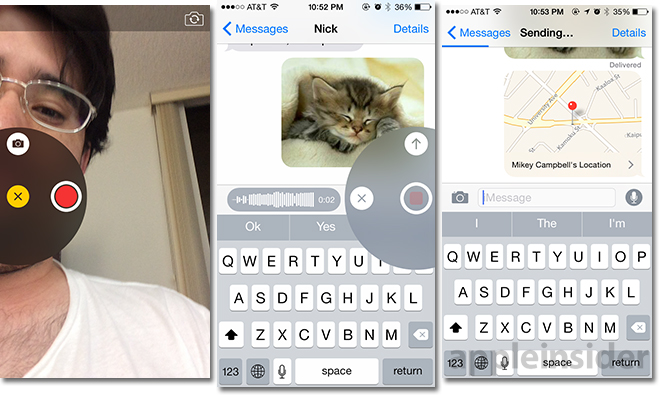 With iOS 8, users can capture short audio clips and "selfie" videos directly from the chat window and instantly send the content off to friends using nothing more than gestures. Audio clip controls, represented by a microphone icon, are located to the right of the text box. Using a tap-and-hold gesture immediately starts the recording process, with a graphical readout of levels and time popping up to the left of the record button. From the radial menu, users can swipe left to cancel the audio clip, swipe up to send or lift their finger off the screen to activate playback controls. Recipients of the clip will see the content as an audio wave form in line with conversation text. Video controls are located opposite those of audio clip recording, but perform in much the same way. Users again apply a tap-and-hold gesture to activate the device's front-facing camera, but swiping right starts recording, while an upward swipe shoots off a still selfie. Once video recording mode is running, users can remove their finger from the screen and choose to end the clip or send it off immediately via radial menu icons. Alternatively, releasing the tap-and-hold gesture without swiping right or up allows users to switch to the rear-facing camera or manually control video record and still image functions before sending it off to a friend. Tapping on the camera icon also brings up the image sharing pane, which now includes a preview of recent photos stored to a device's Camera Roll. The preview is navigable by swiping left and right and users can quickly tick an image or images to send. Older photos and videos can inserted by accessing the Photo library, while the option to take a photo on the spot carries over from iOS 7. Both senders and recipients can view a compilation of the conversation's attached files through the Details window, which also contains options for sharing and sending your location. If an immediate location is shared —in one hour, one day or indefinite time spans —all participants in the chat will be able to plot a user's whereabouts via a Maps insert. Sending location data, on the other hand, is a one-time message that includes metadata for viewing in the iOS 8 Maps app. On the topic of groups messaging, iOS 8 Messages allows users to create and label conversations, invite friends and, most importantly, leave the thread at any time. In addition, Do Not Disturb settings can turn off alerts for a specific group chat, offering granular control over conversations taking place between members located in different time zones. Finally, Messages also integrates with Notification Center to bring interactive notifications to all areas of iOS, including the lock screen. For example, when a banner appears at the top of the screen, users can tap it to pull up messages, or swipe down to bring up a text entry box and keyboard. From here, users can type their reply, or even quickly record an audio clip, and send it without having to close the task at hand.